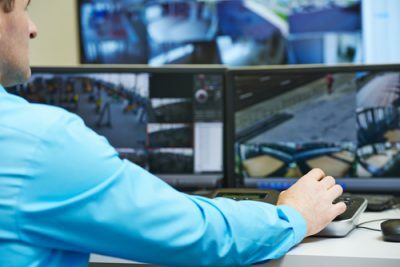 The increase in criminal damage, theft and assault in recent years has seen the unprecedented rise in the installation of CCTV systems in the UK. Whilst acting as a deterrent, CCTV camera systems are also an excellent monitoring tool and powerful solution in helping bring criminals to justice. They also offer staff,customers and homeowners peace of mind, especially in places such as car parks, dimly lit areas and other places where people feel vulnerable. We offer a range of CCTV systems that are designed to suit almost any application requiring a view of a given location, and are able to specify the latest in camera design and operation, through which you can live view through your smartphone. This means that no matter where you are in the world, as long as you have internet access you can see whats happening at your premises or house from your location. © Hallmark Security Limited, 2019. Hallmark Security Limited holds SIA approved contractor status for the provision of Security Guarding & Key Holding services.